Take a view of London like never before. Get behind the scenes to watch its incredible technologies. Megacities uncovers the rapid growth, new forms of spatial density of population, formal and informal economics as well as poverty, crime, and high levels of social fragmentation. Megacities takes a revolutionary look at the places where most of us live: the modern Metropolis. Megacities focuses on the single aspect of a city's infrastructure which best informs the life and functions of that place. Each city is examined as an organism: living, breathing, and growing. In order to survive, these infrastructures must each function independently, and yet blend into a harmony of man, machine, strategy and system, which defines it as a mega city. Megacities examines the infrastructure of eight iconic locations around the world: Las Vegas, Mexico City, Hong Kong, London, Paris, Sao Paulo, Mumbai and New York. 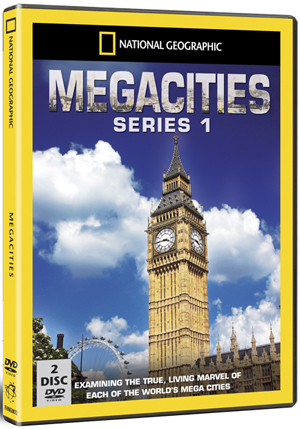 Through dramatic storytelling, unparalleled access and sophisticated computer graphics blended seamlessly with live action, Megacities takes viewers beyond the monuments - and into the machinery - that is the true, living.